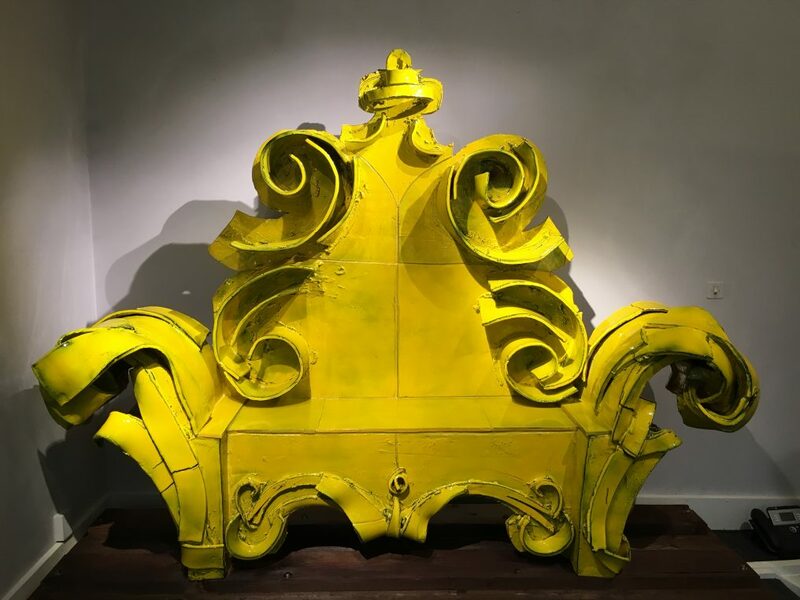 His great grandfather, Vittorio Ducrot was a foremost art nouveau furniture designer in Palermo. His mother is a forceful painter and textile designer, his grand father was an engineer and he used to play around in his workshop when he was little. 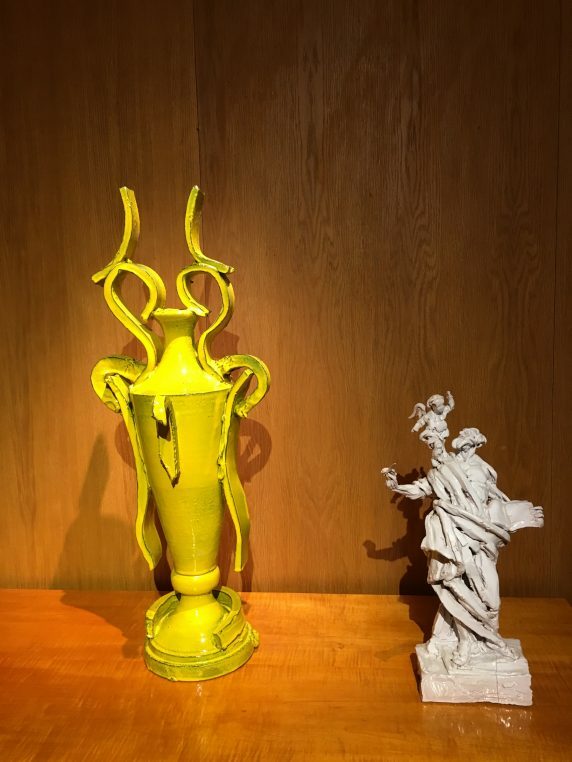 But Giuseppe Ducrot has definitely found his own artistic track and the ceramics he exhibits at Galerie du Passage, show an extraordinary classicist’s culture and great modernity. 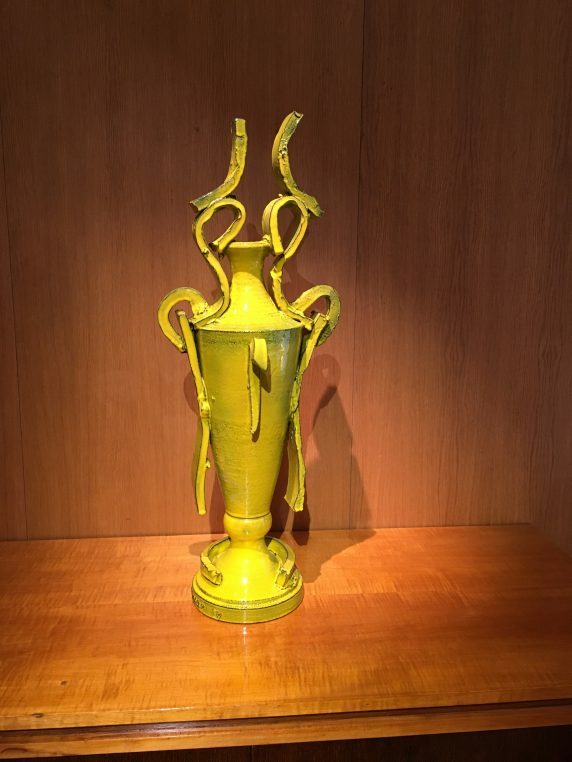 It is one of the most original private show in Paris at the moment. Giuseppe Ducrot‘s charm is only equalled by his obviously very large culture. After studying classics at university and training with sculptor Vito Cipolla in Rome, he had his first exhibition of bronze and marble busts of Roman emperors. He then discovered the workshops of Faenza, near Ravenna, where he started enameled ceramics at Ceramica Gatti. 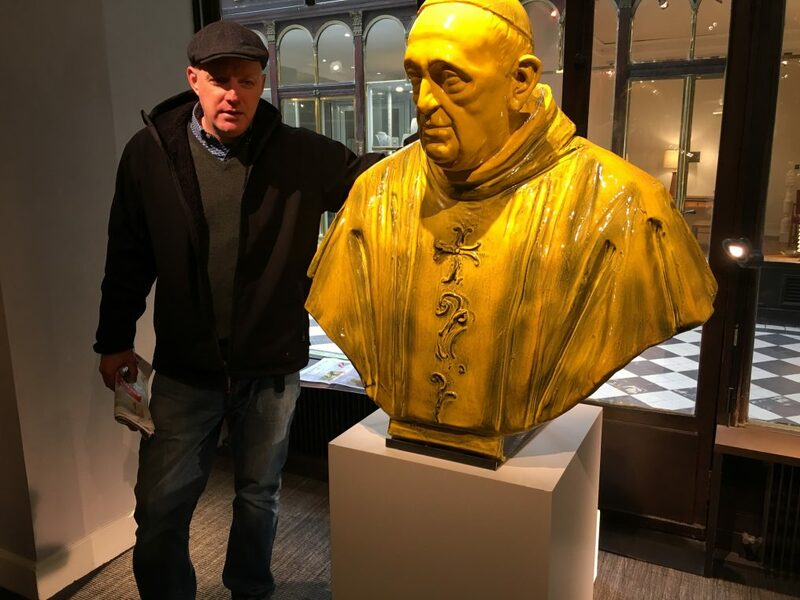 He has always mixed religious art, like the silver bronze altar and crucifix in the cathedral of Notto in Sicily, and the statue of Santo Anibale for the Vatican with private decorative work for German, British and Italian collectors. It is strangely, his first show in France where his family originally comes from. 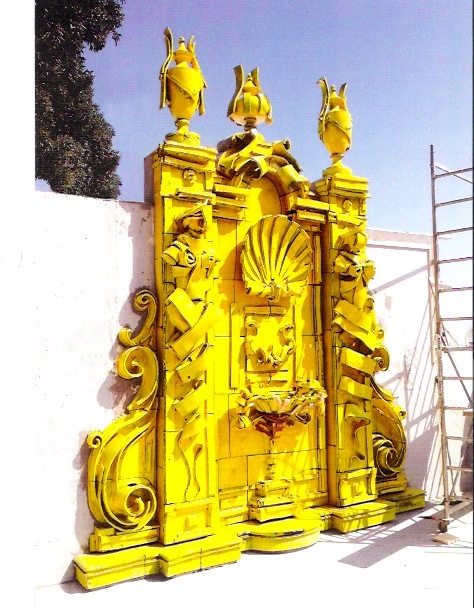 His dream is to build a church in ceramics like the fountain that he designed for a hotel in Positano. The ceramics he uses is strong enough to sustain rain but not freezing weather. He works with many specialists including a brilliant technician from Positano who also works with Mallorca artist Miquel Barcelo on his cathedrals. 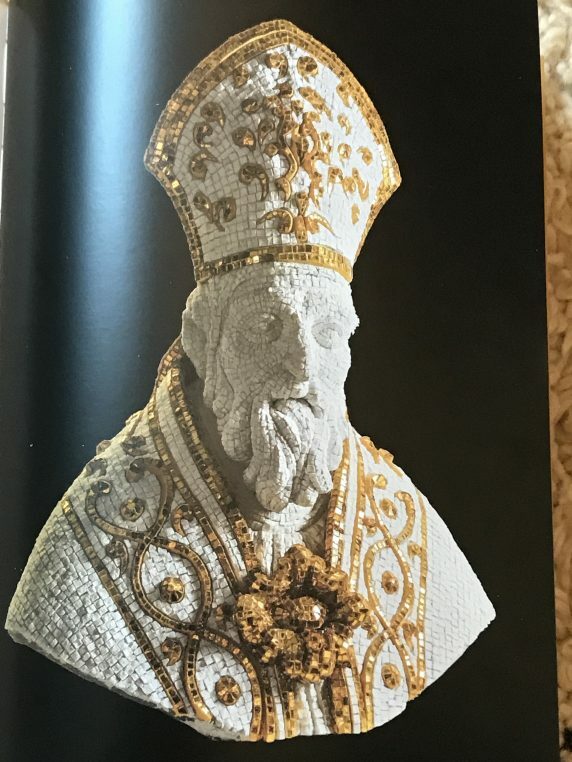 While in the 1980’s it was not cool to work for the clergy, he has now developed many projects in Bavarian churches and at the Vatican where he has sculpted a 6m high Santo Anibale in marble. He has also made a fireplace in white ceramics for a hotel in Lech, Austria and shows at Galerie du Passage a bust of Pope François which is more real than the model! For him, Popes are today what emperors were for the Romans. They have the power, the language and a mission. 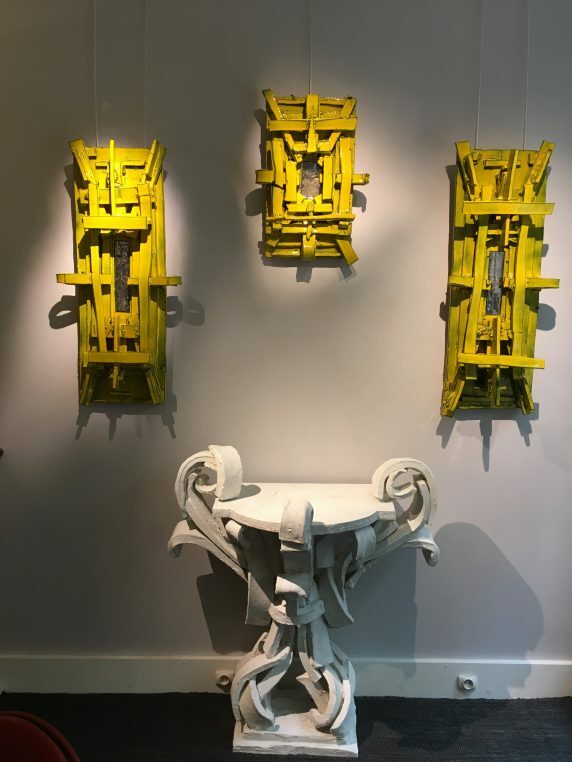 Take your time in the Galerie to look at Christian Louboutin’s three shops, at By Terry home’s new plates and glasses shop and make up, and many more furniture galleries that have recently revamped galerie Vero-Dodat, a few steps from the Louvre and the Palais Royal.